One of the hardest challenges for a photographer is to master distance in a picture. 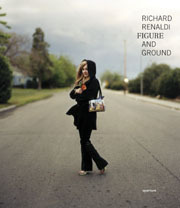 Looking at the work of Richard Renaldi in Figure and Ground I am mindful of a photographer who is wrestling with this too. The book is substantial in volume, a collection of photographs from discrete projects made over the last seven years and adopting a dual viewpoint of the American land and its people. Renaldi works with brief acquaintances. Travelling freely, his portraits are often made during breaks from listless jobs, or in the stations and waiting areas endured in transit. He photographs those who sit quietly in thought or in limbo, chasing a dream or quietly leaving. These studies are captioned with a note of first names and the long journeys pending  a strategy that draws a sense of vulnerability in the movement of real lives across a vast and insurmountable country. Working with such a breadth of population can make a piece of work too general. If there is an emphasis, it is that Renaldi’s subjects are often adolescents, preoccupied and adorned with tattoos or the personal fashions of (self-) conscious American Youth. In an otherwise empty bus terminal in Amarillo, Texas, a teenage girl shapes herself and faces the camera. Her grey sweatshirt is stained and worn-in above a pink skirt. Her eyes, perhaps the last thing to notice, are red and tearful. In this, one of the stronger pictures in this monograph, the clarity of large format colour photography adds such details and complexities. Returning to a sense of distance, Renaldi’s subjects often seem withdrawn within the frame. In Winslow, Arizona, against an unremarkable bungalow sprawl, a young woman is vivid against late autumn light. Occupying the centre of the frame, she feels a few steps away, somehow remote to us. Quietly, this becomes a signature in the work, the binding of people to their own towns and streets. In this respect, they are more engaging than some of Renaldi’s closer studies that slip from the pulse, and lessen the book’s cohesion.